Oops, took a minor hiatus. Wish I could say I have been sunbathing in this amazing weather, but, nope. Working on some fun projects though that we will be telling you about soon. What do you think about making a vanity from an old bed frame? We might just do that. Anyways, on to our featured material for this week. We do have a slight obsession with countertops because they are such an important element, both functionally and aesthetically. And I hate to tell you that granite is one of my least favorite materials because you might curse me and never read my blog again which will make me sad so Im not going to tell you that. Im just going to keep telling you about more and more options that are not that thing that Im not going to tell you is one of my least favorite materials. 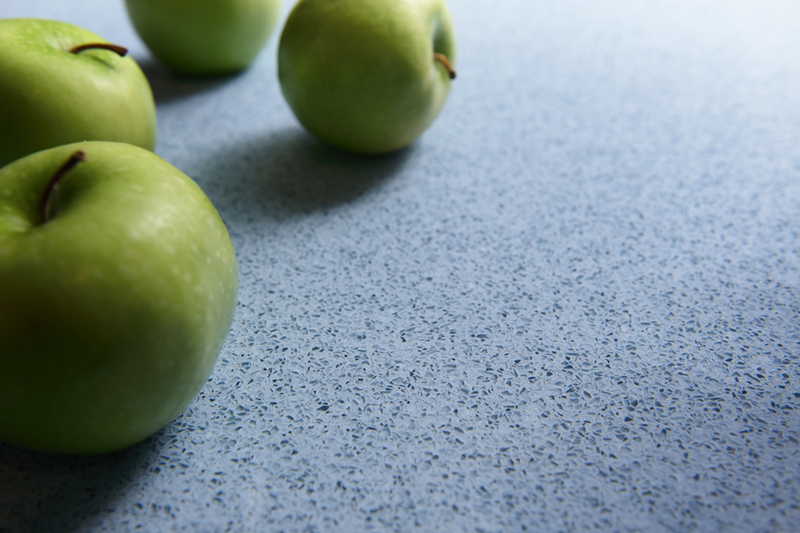 Today we are talking about IceStone, which is a recycled content material that has been used in a variety of residential and commercial applications such as kitchen countertops, bath vanities, bar tops, conference tables, reception areas and window sills. If you have any doubts about the sustainability of this product, just check out its many 3rd party certifications. IceStone is the only gold level Cradle to Cradle® certified surface in the world (basically everything about it is sustainable), and has even been installed in the USGBC’s headquarters. Sold. The three main ingredients are 100% recycled glass, Portland cement, and pigment. It is not made with petrochemicals or resins, so it is free of VOCs and will not fade. The surfaces are made in Brooklyn, NY and the cement is sourced from York, Pennsylvania. 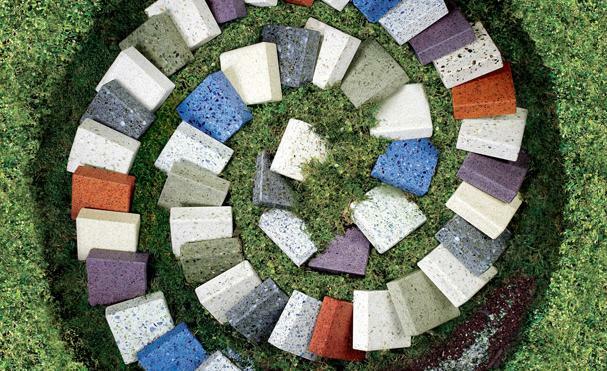 Icestone is a truly sustainable company, dedicated to helping the environment and their community. Since 2003, they have diverted over 10 million pounds of glass from landfills. Icestone is also a “For-Benefit” corporation (otherwise known as a B corporation), meaning they value social, environmental, and financial considerations equally. IceStone’s goal involvement with the B Corporation community is to provide leadership, teamwork, and the models to fortify the presence of sustainable businesses. They strive to treat their employees well and pride themselves on being diverse. Because production of Icestone involves the use of a lot of water, they have a large water recycling system in which they reuse the water within the factory which is located @ the Brooklyn Navy Yard. To learn more about the manufacturing process and company, check out this video. Since Icestone does contain a mixture of porous cement and glass, it is not truly as durable as granite. Hairline cracks are a common problem in concrete products, so installation needs to be done carefully. Get an installer who knows this product. Icestone has to be regularly sealed. The product should be sealed and waxed every 6 months depending on use (how to know when it is time to seal: if you put water on the slab and it beads up, you can go a bit longer without sealing, if the water sinks into the slab, it is time to seal). Granite usually also has to be sealed, although not as often. Sealing is easy, don’t be scared off by this. Give a little, get a lot. Excessive heat may also be an issue with Icestone, the company does not recommend placing a hot pot on their surface. But hey, that’s what trivets are for. Soapstone is one of the only materials we recommend placing a hot pan directly on. Any liquids or stains should be cleaned up immediately, Portland cement is porous so staining could occur especially if not properly sealed. Icestone is made partially of glass, so what about scratching and etching? Icestone claims that scratching is not an issue unless you take a key and run it across the surface, however it may etch with contact of acids and strong alkaline cleaning products. According to Dwell magazine, who did a test on several new countertop materials, yellow mustard etched the surface. We are just the messenger. Since Icestone is sensitive to heat and subject to etching and staining, it may not be the perfect material for your kitchen depending on your use. Consider how much you abuse, or don’t abuse, your counters. Perhaps it is better matched for a bathroom. Mix it with a clean white, warm wood, pop of color and you have yourself a fun little space. Maintenance: no oil and vinegar based products, harsh chemicals, bleach ammonia, and/or acid based cleaning products. Each slab measures 52.5 inches wide, 96 inches long and 1.25 inches thick. Thanks so much for your review of IceStone! We actually have 21 colors now in the palette (instead of 27). Please follow us on Facebook and Twitter for our latest product updates. So happy you have found me. I'm an Interior Designer who promotes healthy homes for those who inhabit them and those who build them. How things are made and where they come from is important to me. And I love things that have a story to tell. This blog is where I can share with you details about sustainable products, beautiful spaces, talented artisans and anything else that inspires me. If you have a space in your home that is overwhelming you, send me a picture along with a description of your challenges and I'll do a post for a little inspiration. Looking for e(asy) design? Check out my eDesign page.